Astrophotographers Bob and Janice Fera took this image of NGC 1973, or the Running Man nebula, on Jan. 2-4, 2013, from Eagle Ridge Observatory in Foresthill, Calif. The Feras used an Officina Stellare RC-360AST 14" f/8 Ritchey Chretien Cassegrain telescope with two-element field flattener to observe nebula. An Apogee Alta U16M CCD camera with Astrodon filters was used to capture the photo. 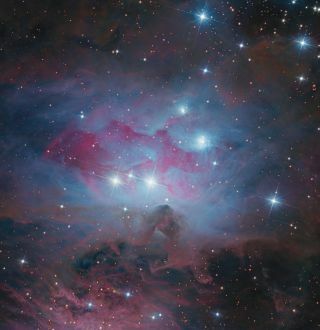 The ethereal strides of the Running Man Nebula come into view in this stunning night sky photo. Astrophotographers Bob and Janice Fera took this image of NGC 1973, also known as the Running Man Nebula, on Jan. 2 to Jan. 4, from Eagle Ridge Observatory in Foresthill, Calif. The Feras used an Officina Stellare RC-360AST 14" f/8 Ritchey Chretien Cassegrain telescope with two-element field flattener to observe nebula. An Apogee Alta U16M CCD camera with Astrodon filters was used to capture the photo.